Also known as The Valley (Obscured by Clouds). Year: 1972. France. Running time: 106 minutes. Color. In French with optional English subtitles. Widescreen 2.35:1 aspect ratio. Directed by Barbet Schroeder. Starring Bulle Ogier, Jerome Beauvarlet, Monique Giraudy, Michael Gothard, Jean-Pierre Kalfon, and Valerie Lagrange. Music by Pink Floyd. DVD release by Home Vision Entertainment. During the opening credits of Barbet Schroeder's fable La Vallée, the camera swoops over a mysterious mountain range dotted with trees. The landscape glows with an eerie greenish tinge. Most of the view is obscured by thick clouds. Meanwhile, the original musical score by Pink Floyd sets an ominous tone, and a voiceover narrator tells the myth of a valley hidden by veils of mist. Later in the film we learn that the mountain range is one of the last uncharted landmasses in the world. Even on maps, large portions of the mountains are left white. Although the mountains have been explored, none of the explorers who made it to the top of the range and found the valley have returned. Not only is the journey treacherous, but local mythology claims that once the explorers find the valley they never want to leave. For the valley is paradise, and to leave paradise would bring down a curse on their souls. Vivian (Bulle Ogier) seems an unlikely candidate for a spiritual explorer on a quest for Paradise. She's a quintessential early 1970's material girl, who defines her sense of self by the things she has acquired: a diplomat husband, pressing social obligations, access to government chateaus, a dog named Nouki, and a Parisian boutique. Her desire to acquire feathers from the Kamul, the Bird of Paradise, launches her on the journey. To Vivian the feathers represent another link in the chain of rare, beautiful things which she must possess. The desire to possess the feathers verges on the sexual, as underscored by the scene where Olivier (Michael Gothard) shows her a Kamul feather in a communal tent shared by his fellow travelers. Vivian lovingly caresses the feather, admiring its rich colors, while the sounds of Gaetan (Jean-Pierre Kalfun) and Monique (Monique Giraudy) making love in a nearby bunk rise in intensity. From that point on, she commits every available resource  money, time, her body  to gaining more feathers. Nevertheless, despite the intensity of her desire, the feather remains solely an object that she must possess. A running joke through the first half of the film has her constantly prodding Olivier for the name of the bird the feathers come from while undergoing negotiations to buy them. As often happens in fairy tales and myths, the initial object of attention turns out to be the impetus behind a much grander quest. Buying her way as a passenger and partly acting as Olivier's lover, Vivian joins the expedition in Papua New Guinea led by Gaetan, a hippie shaman who has financed and organized the trip. Their plan is to discover the hidden valley. Her plan is to travel only to the village inhabited by a priest who collects Kamul feathers. As the group travels, Vivian changes. She sheds the patina of civilization as she wanders further adrift from her pressing obligations. She opens up to the possibilities offered by the life force. She has visions. After finding that the priest hasn't seen a Kamul feather in months, Vivian meets with the local shaman who has an extensive collection. While staring into his eyes, she is transported to another level of reality where she encounters spirits who positively acknowledge her presence. Noting her ability to cross into other worlds, the shaman bestows to her two of the precious feathers. By this point, her goals have changed. A short while later, Vivian stands at the crossroads between her former life and the unfolding quest. In a deciding moment, she tells the pilot of her chartered plane to turn back. She cannot return to the life she led before. Her goals have merged with those of the expedition. For perhaps the first time in her life, she has learned to follow her own compass. Towards the end of the film, when Olivier cynically derides the validity of the group's experiences among the tribe that dwells at the foot of the mountains, Vivian energetically defends herself, and by extension the group's experience. There is no question in her mind that her time spent celebrating with the tribe, preparing for the arduous journey into the mountains, brims with authentic, hard-won experience. She has paid a price  sacrificing her old life in order to gain personal transformation, transmuting her lust for material things into a desire for real experiences. By the film's end, Vivian has metamorphosed into an indispensable component of the group. In fact, she may be the most important element. Her desire, combined with her personal transformation and her access to the spirit realms, helps the group transcend the crucible of hunger, doubt, and physical weakness that plagues them at journey's end. In a way, her change acts as an alchemical process on the group. It is only fitting that Vivian, who began her search looking for a feather from the Bird of Paradise, is the first of the explorers to behold "the mist that shines like light" and to point the way into the Valley of Paradise. 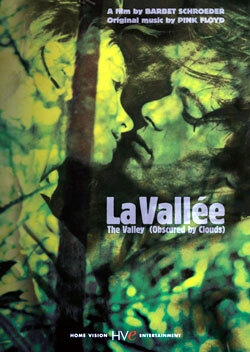 La Vallée has been derided in some circles as hippie tripe. That's unfortunate. Granted, at times the acting comes off as amateurish, especially when Ogier, a French actress, has to deliver her lines in English. Some of the "wisdom" spouted by Hermine (Valerie Lagrange) made me roll my eyes in disbelief that people ever actually talked like this. The tale itself, though, is old as myth and very necessary for these times. Schroeder and company skillfully compose a late 20th Century fairy tale, which dares to suggest that through desire, persistence, preparation, and a willingness to engage the life force on its own terms, we just might be able to find our way to Paradise. Home Vision Entertainments' presentation of La Vallée is a skeletal affair. There are no extra features on the disc, not even a trailer. The only bonus is the accompanying appreciative essay by poet and novelist Andrei Codrescu. There's no hypothesizing of the film's inner meaning by actors trying to recapture an experience thirty years old, no polemical pronouncements as to what the director was trying to achieve to interfere with the viewer's interpretation of this enigmatic and beautiful film  there's nothing but the film to reckon with. Maybe that is as it should be. La Vallée is now available on DVD from Home Vision Entertainment is a widescreen digital transfer (2.35:1 aspect ratio) that has been enhanced for 16x9 televisions. Suggested retail price: $19.95. For more information, check out the Home Vision Entertainment Web site.